You know one thing I love? 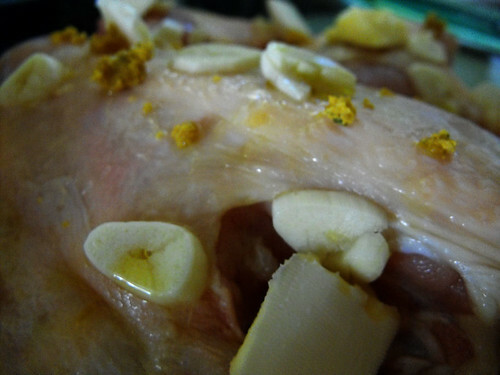 The smell of a slow roasting chicken in the oven, when you can hear the sizzling of the skin and your whole house is inundated with the most delicious scent of garlic and lemon. 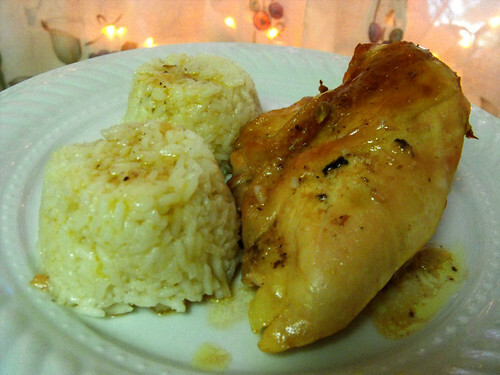 This is a really simple way to roast chicken, serve it with some mashed potatoes, or fries or rice like I did. I'll even show you a quick and easy little trick to make it more presentable and fun for the kids. 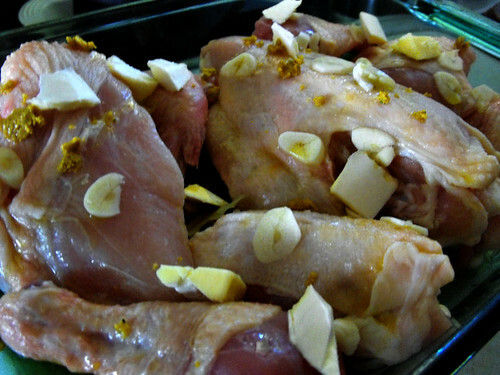 In a baking dish, place the chicken. 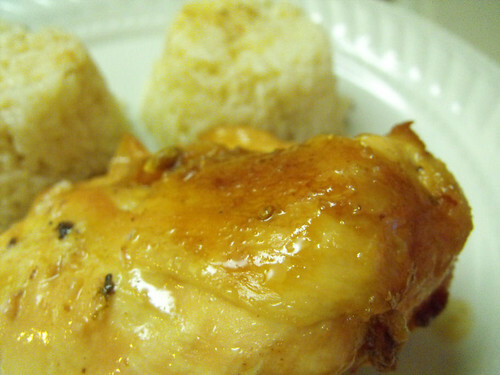 Then I take the bouillon cube and crumble it over the chicken. Add the garlic cloves finely sliced, the juice of the 2 lemons and the bay leaves. Drizzle with olive oil and add some butter cut into small pieces. Cover with plastic wrap and let sit for about an hour. Bake in a 375 degree oven for 2 hours or until chicken is cooked and the skin is nice and brown and crispy. While cooking, I check on it a few times and using a big spoon, I scoop up some of the gravy and pour over the chicken so it doesn't dry up. 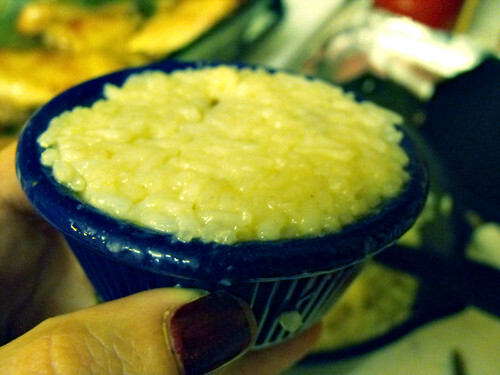 I made some plain rice as a side dish, when it was ready, I took a few big scoops of the chicken gravy and added it to the rice, stirred really well and then scooped the rice into a little bowl that I used to make mounds on the plate. The kids LOVE it and for some reason they are more eager to eat it this way. 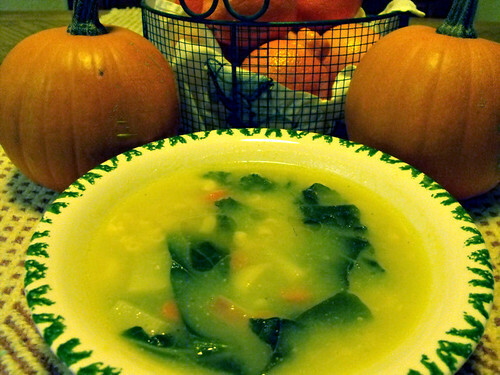 I love soup, for me there is nothing like a bowl of hot comforting chock full of veggies soup. One of my favorite portuguese food blogs "Cinco Quartos de Laranja" recently featured this delicious soup and I knew it was a must make for us. It's one of those soups that take me back to when I was a little one. When the weather got cold, my greatgrandmother very often made big pots of soup to warm our tummies and this one reminds me of her and home and being a carefree child. 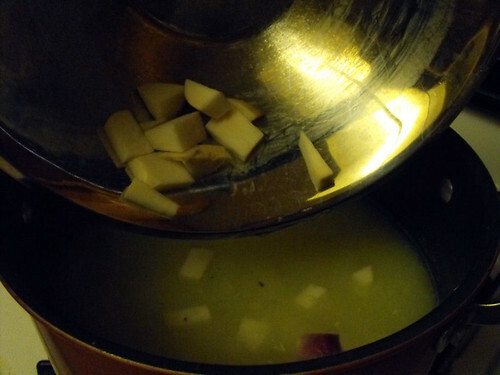 Peel and cut the potatoes, onions, garlic and zuchini into small cubes. Place in a pot, cover with water and cook until the veggies are done. Using a handheld blender, puree the veggies. 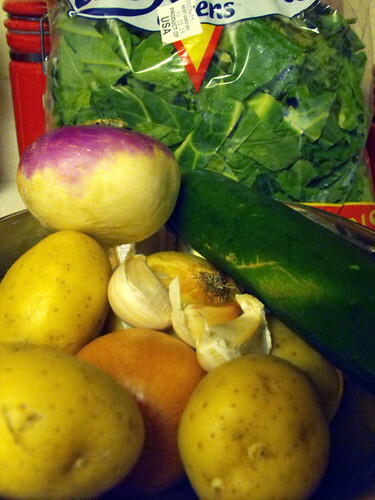 Add the carrots thinly sliced, the turnip cut into small cubes, bring to a boil, then add the greens and the pasta. Add the salt and pepper to taste and give it a good stir so the pasta doesn't sink to the bottom of the pot. When the pasta is cooked, remove from the heat, add some olive oil to taste....I usually just drizzle a bit over the top. Here's another one that takes me back to my childhood. This dessert was made by my great grandmother, and it wasn't that often so when it showed up on the dinner table it was devoured. 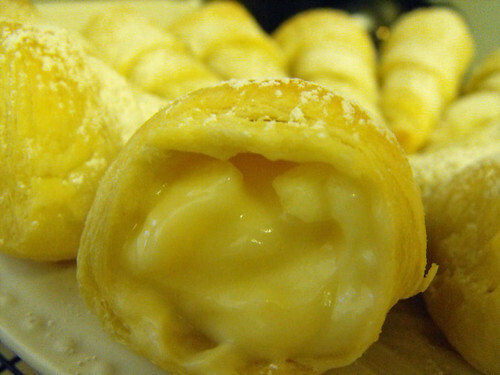 Things were done different back then, there was no puff pastry or pudding for the filling, everything was made from absolute scratch, from the pastry to the egg custard. Thankfully nowadays with the hectic schedules we have, it's great to have shortcuts which allow us to present an amazing dessert that takes little to no time to throw together but looks like a million bucks. Prepare pudding according to package directions. (follow the directions for pie filling). Set aside to thicken. Cut each pastry sheet into 6 strips. 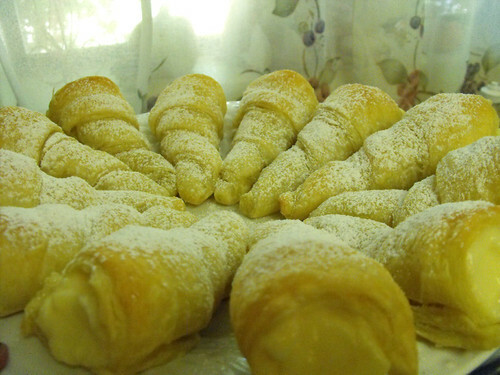 Now you need Cream Horn molds and they are really inexpensive and you can actually get them on amazon. Just follow this link. 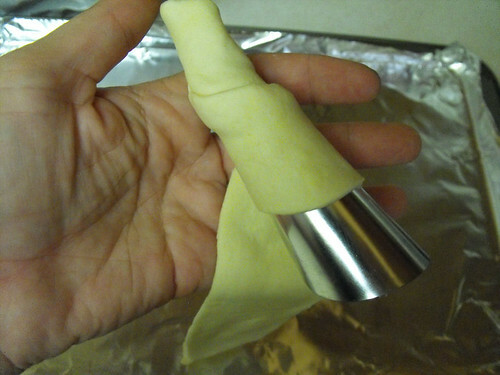 Take each mold and one strip of the pastry and begin wrapping around the mold. Set on a greased baking sheet. Repeat with the rest of the molds. Bake at 400 degrees until golden brown. Remove from oven, carefully remove the mold. 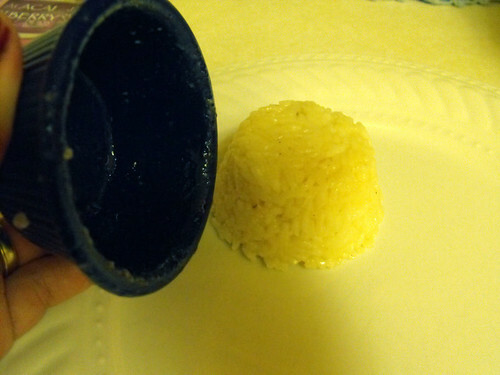 You'll actually find that the mold slides right out, it doesn't stick at all. 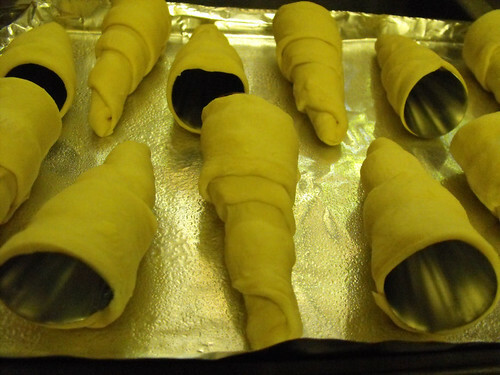 Place the horns on a cooling rack and allow to cool completely before filling. 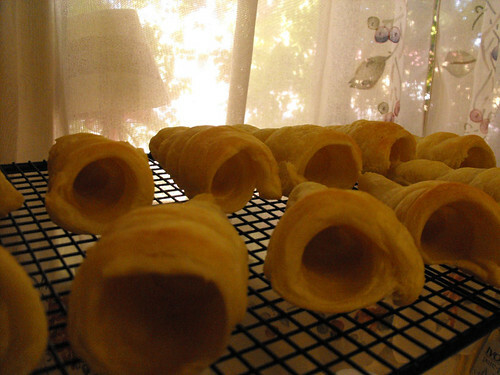 Once they're cooled, fill each horn with the pudding. Set on a plate and sprinkle with powdered sugar. Growing up I remember enjoying this meal many many many times. 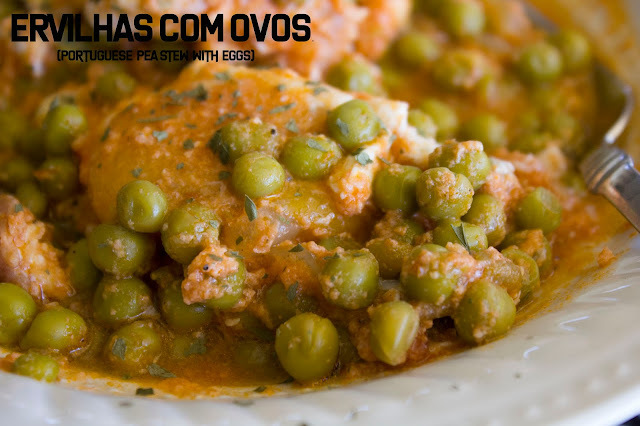 It's one of those that unless you're portuguese, you may find a little weird but I promise, once you try it it will become one of the comfort foods in your home. It's great especially around the fall and winter seasons. So here we go, this one takes me back to my childhood. In a pot, add a little bit of olive oil, add the onions, bacon, tomatoes and bay leaf, cook until onion is tender and bacon is cooked. Add the peas and the tomato sauce, salt and pepper to taste and garlic powder. Stir until well combined. Add a little bit of water if needed to make sure you have a good amount of gravy. Simmer for 15 minutes or until peas are tender. 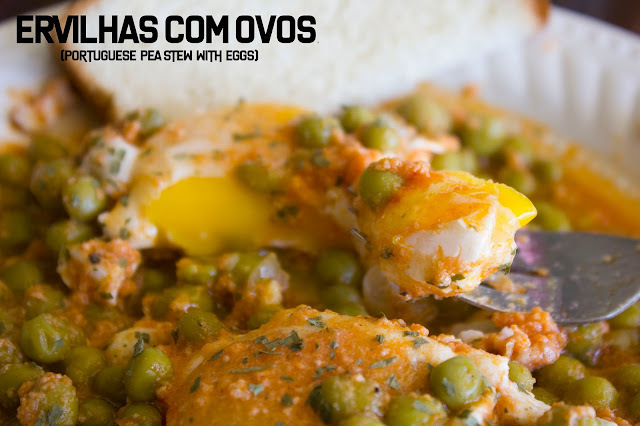 When peas are cooked, take the wooden spoon, make a hole in the peas and open an egg into that whole. Do the same for the rest of the eggs. Do not stir at this point, you want the eggs to poach not break apart. Once the eggs are cooked to your liking, turn the heat off and serve. It's so easy and so simple to make and I think your family will be surprised at how good it is.